"Colossal Construction: The World's Nine Largest Science Project"
Seven of the nine are physics projects! "The Real-Life Trash Robots Who Inspired Wall-E"
"For the past decade, a lot of our worst trash emergencies have been handled by robots...."
The year is 1908, the place is Tunguska, Russia, where a meteoroid or comet blasted into the earth's atmosphere and shattered to pieces, creating a 10-15 megaton explosion. It downed 80 million trees over the Siberian forest, and scientists are certain that the sheer impact of the explosion would have destroyed any major world city. In two years, we'll all be able to sleep a little easier at night, knowing that the earth's new watchdog, NEOSSat ( Near Earth Object Surveillance Satellite) is in orbit. Roughly the size of a suitcase, this tiny telescope will be perched 800 km above the earth. Its sole job is detecting asteroids and other harmful objects before they collide with the earth. For 5 years it will snap photos of possible dangers and beam them back to earth, operating on less power than your average light bulb. Developed by Canadian scientists, the solar-powered NEOSSat is capable of seeking out objects close to the sun. This is a huge advantage over ground based surveillance telescopes, which are severely limited by bad weather and interfering sunlight. The telescope will also serve as an early warning system for orbiting space junk traveling in the path of telecommunications satellites. Smashed satellites can kill cable TV, telephones, GPS, and maybe most important of all-access to money through banking systems. But fear not, NEOSSsat can predict space junk collision paths and send warnings to move satellites. While an event like the 1908 explosion is rare, scientists estimate that there are currently at least 95,000 orbiting meteoroids larger than the one that hit Tunguska. Sound waves, that is. The Supreme Court recently decided to hear the U.S. Navy's appeal of a federal court ruling that banned sonar within 12 miles of the coast, and ordered the immediate termination of high-powered sonar when whales (and other marine animals) have been detected. In light of the sonar-whale dilemma, it might be helpful to run through the basics of underwater acoustics. Sonar is the process of detecting what already happens to sound waves whenever there is a noise: an echo. As sound bounces off surrounding objects, some of them are reflected back to the noisemaker. The acoustic sound waves in sonar (an acronym for SOund Navigation And Ranging) are transmitted through the water in short pulses, where they travel at frequencies high above what humans can hear. The reflected wave signals can then be detected and used to infer the distance and relative position of an object. The military uses sonar to detect enemy submarines and other tools of aquatic warfare. Keep in mind that the speed of sound in water can change, depending on the depth, temperature, and even how salty the water is. So sound waves in an ocean will travel at a different frequency than sound waves in a large pool or lake. The interests on each side of the debate couldn't be any more conflicting. The Bush administrations argues (in the name of national security) that the Navy should be given permission to disregard current environmental laws that protect endangered species, and work themselves into a sonar power frenzy if needed. Plus, they say they already take precautions to protect whales. But the environmentalists say sonar has been proven to harm whales and other endangered marine mammals to the point of death. It is thought that sonar causes abnormal behavior in whales, causing them to disorient themselves and surface the water too quickly, leading to a condition called decompression sickness. 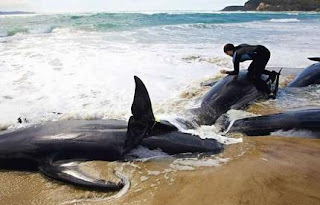 In addition, autopsies performed on whales that died on the Canary Islands hours after a mid-frequency sonar was sent out (as part of an international military exercise), show that there may also be physical effects to sonar. CAT scans showed bleeding around the brain and ears of whales, along with an excess of gas bubbles that filled bodily tissue. 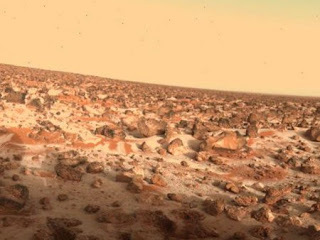 Way back in 1984, when the Berlin Wall was still erect and everyone felt obliged to read George Orwell, a few astrogeologists came up with a theory to explain why the northern side of Mars is smooth and flat, while the southern side is marred with craters and highly elevated. They proposed that something really large slammed into Mars, creating a creating split almost down the middle of the planet. 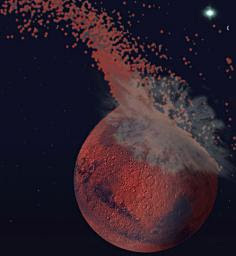 Their ideawas influenced by another theory circulating at the time; that the moon formed by a chunk of Mars breaking off after a massive impact. The major crash theory didn't develop much beyond that. After sitting on some dusty academic shelf for the past 25 years it has finally been revived, thanks to new evidence from recent research. Scientists now believe that something similar to an asteroid or a comet smacked into Mars about 4 billion years ago. Moreover, the giant crater left over from the impact may be the largest in our solar system, about the size of Asia, Europe, and Australia combined. The sheer size and shape of the crater provides conclusive evidence that Mars must have experienced a significant impact. A small part of the crater was actually uncovered in the 1980s (dubbed the Borealis Basin), but because a large portion is hidden under thick layers of lava, not one could map it entirely until now. Researchers analyzed data from two Mars orbiters, studying crust thickness, surface elevations, and the gravitational pull. Using this information, they were able to reveal what lay beneath the lava. What they found was a huge scar that stretches between the two very different terrains of the planet. It covers about 40% of the surface. A model simulation was also created to determine the size of the mystery asteroid or comet and exactly where it hit. Gaining clues into the impact, researchers figured out what happened in the aftermath. By bombarding a model simulation of Mars with various sized objects, they were able to pinpoint the conditions needed to result to in the formation of such a huge crater without melting the entire planetary crust. "Leaving Academia: Cry or Celebrate?" "Universcale: Physics is All About Scales"
You know you've always wondered how to make your own USB fan; this video shows you how! What does fMRI really tell us about the inner workings of the human brain? "Asteroid Apocalypse Prevention Finally Gets Some Funding"
Somebody page Bruce Willis and let him know the mission's back on! Meet Nick Veasey, who is following in Roentgen's footsteps by taking photographic art into the X-ray regime. "Breaking: LHC Still Will Not Destroy the Earth"
"Black Holes at the LHC: The CERN Safety Report"
The search has begun for a planet just like earth-from lush green fields to mountains to cold deep rivers and waterfalls. 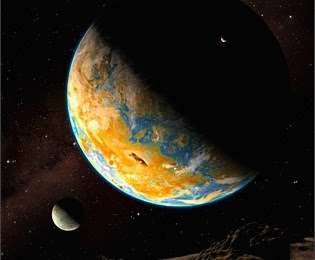 Of course, other earths would have to be made up of elements similar to our own, and orbit at a special distance required for liquid water to exist on its surface, called the habitable zone. Astronomers are using new technology to scan other star systems for clues to unexplored earths. They are now capable of viewing faint wobbles in a star's motion, that are caused by the gravitational pull of an orbiting planet. Advanced telescopes also let researchers watch for a dimming of light in stars that occurs as an orbiting planet passes in front of it. Thousands of stars can be monitored simultaneously. In the winter of 2009 NASA will launch its Kepler mission, designed to seek out planets orbiting massive stars, like how our earth orbits the sun. Kepler will keep an eye out for starlight dimming in 100,000 stars. Glass has always been a material shrouded in mystery. For decades it appeared to be structured in the same way as a liquid, or so scientists thought, in a form resembling both a liquid and a solid. Recent research conducted in the UK has proved for the first time that glass is not structured as a liquid, but it's not a solid either. They discovered that glass forms 20-sided atomic structures called icosahedrons (see right), which form upon cooling. This means that glass has some truly unusual properties that could one day lead to the development of airplanes made out of metallic glass. Metallic glass is a special type of shiny black material with plenty of useful applications, due to its strength, durability, and lightness. Metallic glass is ideal for airplane wings in particular, because it does not form a crystalline lattice structure when cooled. In normal metals, stress between crystals can build up and cause fractures. In fact, this type of metal failure caused the world's first commerical jet airliner to drop from the sky and crash. Researchers figured out what happens to cooled glass by mimicking the behavior of its atoms, using special particles called colloids, pictured to the left (actual atoms are too small to be seen when cooled). They observed some interesting behavior; the colloids seen to be going through a kind of identity crisis. 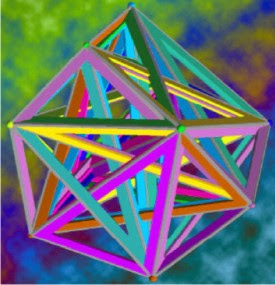 As it cools, glass tries to form crystal lattice structures like a solid, but gets stuck in an icosahedron arrangement and remains that way. Since it is impossible to make a crystal lattice out of icosahedrons, glass fails to become a solid. So resist that human urge to place things into categories like liquid or solid. Give it up, glass is just glass. Scientists have created the shortest-ever flash of light, 80 attoseconds (one billionth of one billionth of a second) long. 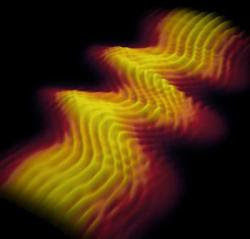 Up until now, the shortest light pulse is recorded at 130 attoseconds, set in 2007. These short flashes have huge implications; they might be able to let scientists view the movement of electrons around large atoms. The flash was short enough to capture an image of a laser pulse previously too fast to be seen ( see photo on left). The method used to generate the flash is akin to a domino effect, initial pulses are fired into a cloud of neon gas, which in turn excite the neon atoms who release energy as super short flashes of light. The flashes from the neon atoms were moved onto a second gas cloud so that the researchers could figure out exactly how short the light flashes were. Further analysis showed light flashing at 80 attoseconds. But scientists aren't done yet. The goal is to make light pulses as short as the time it takes for an electron to travel around a hydrogen atom, 24 attoseconds (considered to be the atomic unit of time). Still not satisfied? The imaging of fundamental particles like protons, at zeptoseconds (trillionths of a billionth of a second) might even be possible someday. 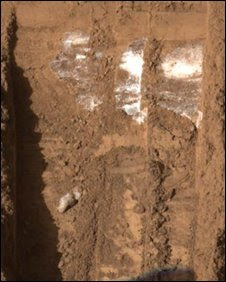 NASA's Mars Phoenix Lander recently dug a trench on the Martian Landscape and captured photos of little chunks of white matter. Four days later, the mysterious stuff had disappeared. Scientists believe it was ice that went through the same process the snowman in your front yard does each winter; it evaporated. Previously, there had been an ongoing debate as to whether or not the material was salt, but the disappearance confirmed that it must indeed be ice. 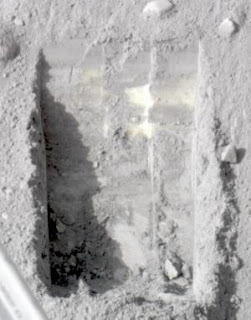 More ice surfaces are likely to be revealed as the robotic arm continues its work. Early on it refused to continue digging, even when it was told multiple times to explore a "polygon" region nearby the lander site. Halting is how the Phoenix is programmed to respond when it hits a hard surface beneath the soil. Polygons are formed when permafrost (permanently frozen soil beneath the ground's surface) repeats a cycle of freezing and thawing, over many thousands of years. 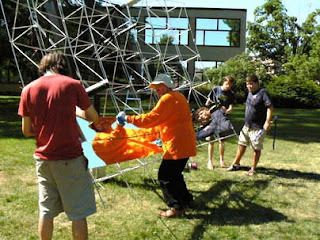 The result makes patterns comprised of cracks and wedges into polygon-like shapes in the ground. The finds provides somewhat of a morale boost for researchers in charge of Phoenix, as previous digs yielded nothing but soil. The goal of the mission is to search the the polar region of Mars for evidence that this part of the red planet could support life. "Drunkard's Tennis and the Advice of Winners"
"Why Do Scientific Theories Work?" "Testing Your Free Energy Machine"
"Spike Lee Will Uncover the Mysteries of Time Travel"
"Fermilab Takes Stage in The Da Vinci Code-like Thriller"
And finally, courtesy of Asymptotia, check out the CDF Virtual Tour, where you can follow the path of a subatomic particle from its creation at the center of the detector all the way to the outer limits of the machine. 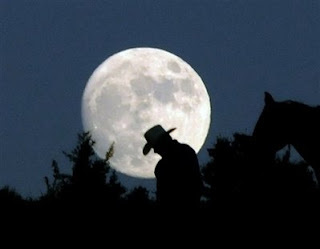 While the moon is actually never full, this evening, Wednesday June 18th, it will seem abnormally huge to most people. Don't worry, it's only your mind playing tricks on you. This optical illusion, known as the Ponzo illusion, makes it seem as if the moon is bigger when it's near the horizon. The effect is exaggerated during the "full" moon. Unfortunately, human eyesight can't be trusted when dealing with extremely large distances. The moon is not any larger overhead than it is near the horizon. Mario Ponzo first determined that our minds sometimes gauge the size of an object based on the background behind it. Because we perceive the sky as an extended dome, the moon appears to be very distant when on the horizon. On the other hand, things like clouds and airplanes, which are viewed directly overhead appear (and really are) much closer. So naturally. we tend to think that the moon is closer when viewed overhead too. But the idea of the moon being farther away because it is on the horizon rather than overhead is only an illusion, as the moon is beyond the sky and hundreds of thousands of m iles away, far enough to remain unchanging. Since during a full moon its size doesn't appear to decrease, and yet it is located on the horizon, we are tricked into thinking it must be bigger. And that is in fact what we see. NASA says that the moon illusion is particularly strong and long-lasting during the solstice, two days before the start of summer in Northern Hemisphere. The skin-like silver cloth stretched over BMW's new GINA Light Visionary Model (GINA stands for "Geometry and Functions IN 'N' Adaptions") is actually seamless fabric covered in a flexible wire mesh frame. 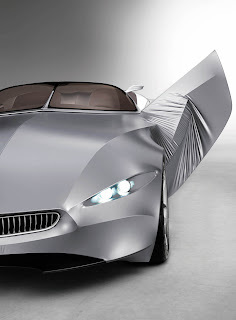 As a result, the car is capable of changing shape, bending and twisting like a living animal. The fabric is made of polyurethane-coated Lycra and is water resistant. The aluminum frame is controlled by electric and hydraulic actuators, allowing the owner to alter the car's body shape at whim. A whole host of questions about the design comes to mind. How is tension created to stabilize the fabric at high speeds? Also, a car covered with a light fabric has much less mass that a gigantic SUV. The difference in force between the two cars upon impact at highway speed would be large enough to probably demolish the person in the GINA. But I suppose the designers weren't too concerned about the consumer plausibility of it all (or people with scissors). 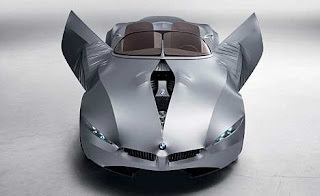 This purely artistic, though perfectly drivable, endeavor is destined for the BMW museum in Munich, Germany. I imagine the earth must be fairly dusty by now, as it receives about 40,000 tons of dust particles from space each year. But once in awhile (NASA has been collecting dust since 1982), a unique mineral is found among the clouds of interplanetary dust. Scientists recently discovered a new mineral, which is thought to have originated from a comet, although its properties are so unusual that no one is really sure where it comes from. 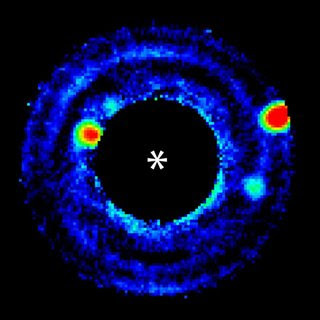 Space dust is particularly interesting because its composition holds clues as to how our solar system is formed. Very tiny clues. The grains of the mineral, a manganese silicide named Brownleeite (named after astronomer Donald E. Brownlee) were approximately 1/10,000 of an inch in size. The researchers used a transmission electron microscope to study the mineral's nano-scale crystal structure and chemical composition. Two mathematicians fiddling around with an extension of the fundamental theorem of algebra had no idea of the significant implications their work held for gravitational lensing, a prediction of Einstein's general theory of relativity. 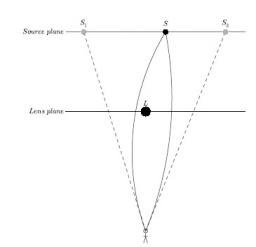 Turns out Dmitry Khavinson and Genevra Neumann proved physicist Sun Hong Rhie's theory on gravitational lensing. 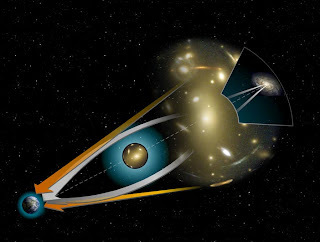 Gravitational lensing explains the deceptive behavior of light traveling at extremely far distances. A gravitational lens forms when distant light from a particularly bright source, like a star, "bends" in both directions around a massive object. This cosmic optical illusion misleads the observer (usually here on earth), into thinking the light originates from 2 sources, when in fact there is only one. What looks like 2 different stars is actually the same star. The light-tricks depend on where the massive object lies and how many massive objects there are. A star looks like a circle when the massive object is directly between the star and the observer. A multitude of objects means the observer will view what appears to be a multitude of stars. Rhie had been trying to determine how many mirages of stars could be created by the bending of light. She calculated that four massive objects lead to 15 ostensible stars, coming up with the formula 5n-5 stars, where n is the number of massive objects. Unfortunately, being "p retty sure" of something doesn't cut it in science: she needed cold proof. Over on the west coast, mathematican Jefferey Rabin stumbled across Rhie's work and took a stab at it. He spent months on the problem with little success. In a simple twist of fate, someone in Rabin's department had left an article on the printer. Passing by, Rabin read it and realized someone had solved the problem, but with purely mathematical aims; they were completely unaware of gravitational lensing. That article was Khavinson and Neumann's, and their work with rational harmonic functions had unknowingly proved Rhie's assertion. Another example of how important the dissemination of scientific knowledge is! Accidental discoveries make for great stories. GLAST finally launched on Wednesday, after a series of delays. "Guest Post: Joel Corbo on Graduate School and Teaching"
Disappointed with some aspects of his grad school experience at UC-Berkeley, Joel Corbo and friends founded the Compass Project, to support excellence in science and education, especially for women and minorities. The skies could soon get a new addition: a plasma-fueled flying saucer. The mechanical and aerospace engineering professor who created the novel design calls its a "wingless electromagnetic air vehicle" (WEAV). The flat, circular spinning aircraft strongly resembles a flying saucer ( illustration of prototype on left). WEAV has no moving parts, but power lies in its unique dynamics, the force generated by a current or magnetic field passing through a conducting fluid (known as magnetohydrodynamics). Plasma (the conducting fluid) is generated by electrodes all over the surface of the aircraft that ionize the surrounding air. The generated plasma will coat the exterior of wave, producing stable lift and momentum. WEAV's design enables it to ascend into the air vertically. It isn't all sunny days and clear coasting. 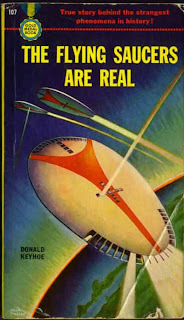 Plasma driven aircrafts have always failed to fly on earth. The average plasma saucer has a much better chance in space, where there is less gravity and drag. More "umph" is needed for flight in Earth's atmosphere. If WEAV beats the odds and takes off easily, other problems are presented once up in the air. For instance, the plasma that propels it will also interfere with electromagnetic waves needed to communicate with the vehicle. 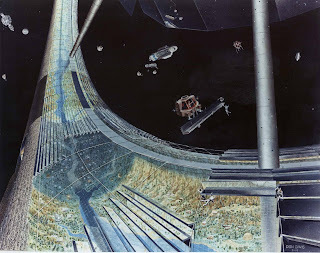 I couldn't resist posting these artist's renditions of life in space, from a time when NASA was seriously contemplating space colonies. 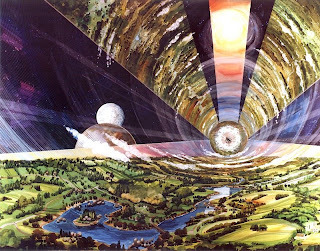 Check out more space colony artwork from NASA here. 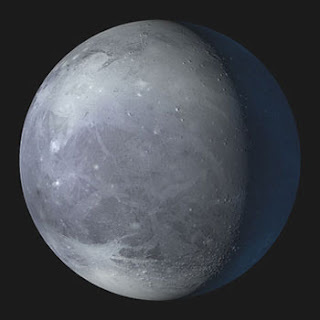 Pluto, formerly known as the ninth planet in our solar system, has officially been given a new label: plutoid. The International Astronomical Union (IAU) decided on the name yesterday, which distinguishes all dwarf planets located farther from the sun than Neptune. Dwarf planets are not-quite-planets, massive enough to assume a near spherical shape from self-gravitational force, but not large enough to have their own orbital zone, or become gravitationally dominant like real planets. The discovery of Eris in 2003 triggered the reclassification craze. Eris, a dwarf planet larger and farther from the sun than pluto, is currently the only other plutoid aside from pluto. Astronomers examining Eris' characteristics became aware of certain discrepancies in bodies characterized as planets. The demotion of pluto to a nameless dwarf planet by the IAU Committee on Small Body Nomenclature followed shortly in 2006. And by "sale" I mean anywhere between hundreds of thousands to millions of dollars. Titled "Important Scientific Books," from the library of retired physician Richard Green, next week in New York Christie's Auction House will be selling the original scientific works of folks like Descartes, Freud, Darwin, and Marx, to name a few. 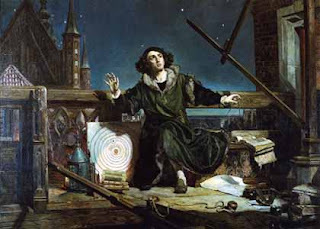 Nicolaus Copernicus' 1543 "De revolutionibus orbium coelestium". This is where Copernicus notoriously described how the the sun, not the earth is at the center of the universe, and developed his ideas of planetary rotation around the sun. Sir Isaac Newton's 1687 "Philosophiae Naturalis Principia Mathematica". It was here that Newton clarified his universal physical laws of gravitation and motion, describing the mathematics behind the motion of bodies in unresisting space (intertia), laws of gravity, and the motion of fluids. Max Planck's 1900 "Zur theorie des Gesetzes der Energieverteilung im Normalspectrum". This is where planck laid out his quantum theory for the first time, asserting that energy flowed in pulses or bursts known as quanta, not as continuous currents. Planck also determines his constant of angular momentum, which we all know as Planck's constant. Johannes Kepler's 1609 "Astronomia nova Kaititologhtosk seu physica coelestis, tradita commentariis de motibus stellae martis ex observationibus G.V. Tychonis Brahe". Definitely a cornerstone of modern astronomy. Kepler dicusses his laws of elliptical orbits and the law of equal area: the first two laws of planetary motion. Anders Jonas Angstrom's 1868 "Recherches sur le Spectre Solaire". 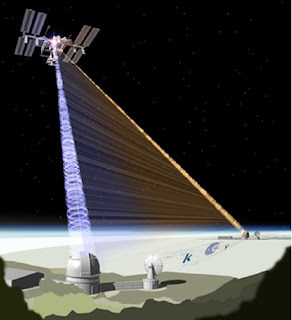 Here Angstrom establishes his scale of wavelengths for measuring spectral lines based on what is now known as the "Angstrom unit", one ten millionth of a millimeter. He also demonstrates, for the first time, that the sun contains hydrogen and other elements. John Dalton's 1808 "A New System of Chemical Philosophy". A classical work on the atomic theory of matter. Dalton argues that matter is composed unchanging, indivisible atoms of different weights, and that each weight corresponds to a chemical element. Galileo Galilei's 1606 "Le operazioni del compasso geometrico et militare". This first edition is extremely rare, as there were only 60 copies printed. Here Galileo made numerous mathematical additions and changes to the "geometrical and military compass", based on an earlier (before 1597) prototype. Galileo improved the compass so much his design remained in use until the mid 1800s. James Clerk Maxwell's 1873 "A Treatise on Electricity and Magnetism". In this major work, Maxwell illustrates how important electricity is to the study of physics, and to develop his theory that light, magnetism, and electricity are ultimately the same in nature. This idea provided the basis for Einstein's theory of relativity. Scientists perform experiments in order to test a theory. If enough data is generated to support a claim, that claim is usually declared true. But what if the experiment continuously gave a predicted result only because the scientist was on earth? Perhaps a different outcome occurs in space. This is the argument behind a recent proposal to launch a mission called Space-QUEST (Quantum Entanglement for Space Experiments). Anton Zeilinger of the University of Vienna submitted the proposal to the European Space Agency. He wants to perform quantum entanglement experiments for the first time in space, at the International Space Station (ISS). Quantum entanglement describes the complex way particles are linked together, such that one cannot exist without the other, regardless of distance. Superposition, the ability to get two different but related measurements, is central to an understanding of quantum entanglement. According to quantum theory, measurements made on linked particles, no matter how far away, are instantaneously influenced by one another. Einstein notably poked fun at the idea of instantaneous influence, labeling it "sooky action at a distance", as it violated certain predictions of special relativity. He disliked and dismissed quantum entanglement entirely. This is summed up in the EPR paradox, a thought experiment by Einstein, Podolsky, and Rosen. But numerous short-distance experiments on earth have agreed with quantum theory and provided strong evidence of quantum entanglement. The experiments involved sending two entangled particles, for example photons, to separately located scientists, who then take measurements. Despite this, there are some who believe that the results are a false positive. Quantum entanglement may only work on earth, where distance is limited. Maybe something different happens to entangled photons over enormous ground-to-earth distances. Zeilinger is determined to find out. Since he's already proven that single photons can be detected on the ground by bouncing them off orbiting satellites, he plans to separate two entangled particles at a distance never before tested, one particle to an orbiting astronaut in space (At the ISS), and the other somewhere on the ground, here on Earth. Maybe Einstein will be proven right. And yes, the title alludes to tangled up in blue (arguably my favorite Dylan song). Atoms act really weird if only a few of them are grouped together. Gold and other (typically metal) atoms begin to form highly symmetrical structures depending on the number of atoms clustering together. 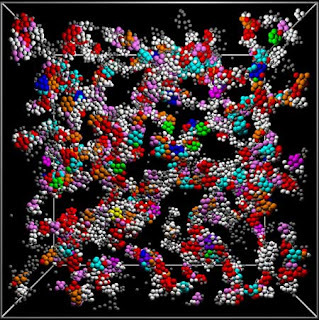 These clusters take on the characteristics of the single atoms of a completely different element, transforming into what scientists have dubbed "superatoms". What makes regular atoms become superatoms is their ability to transform physical properties and imitate those of other elements at extremely small scales. What we can observe with the naked eye, the size, shape and color of a certain material, changes as the number of atoms is reduced, starting at around a few million. For example, silicon is normally rigid and breakable, but group a small number of silicon atoms together and they become malleable, almost supple. Quantum dots, a type of semi-conducting particle, displays light across a spectrum of colors, depending on their size. Superatom behavior is even more perplexing at smaller scales. Take 20 gold atoms and they will aggregate into a solid pyramid. 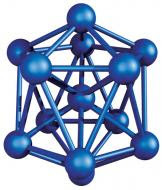 Remove a couple, and 16 atoms will display a cage-like structure. 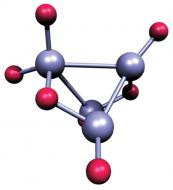 Groups of tin atoms behave like conductors or semiconductors, dependin g on the addition or removal of just a few atoms. Scientists have recently created several new supersatoms and determined their structures. The goal is to use the superatoms of elements such as gold and carbon to develop completely new materials. These custom-made materials would have all sorts of useful properties that we can't obtain from natural materials. 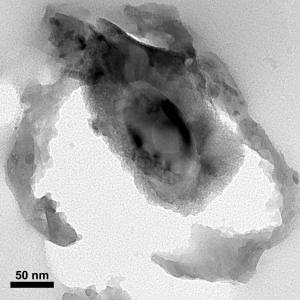 Scientists are currently working on a superatom material capable of storing solid hydrogen at room temperature, in hopes of solving the difficult and expensive problem of transporting and storing hydrogen, needed for the development of hydrogen fuel cells. "Colors of Space, Parts One and Two"
Thanks to fellow intern Justin Reeder for sending me an interesting article this morning, Does Time Run Backward in Other Universes?, published in Scientific American by cosmologist Sean M. Carroll. The article (a formidable 6 pages) tackles those ever-so-elusive problems relating to the origins of our universe, and presents a couple of intriguing explanations. Almost as important are the comments at the bottom of the article, which provide a handful of concise critiques and different perspectives. The author, a physics researcher at the California Institute of Technology, discusses the main ideas behind his and fellow colleague Jennifer Chen's theory that attempts to reconcile the arrow of time (the irreversible unidirectional time we observe) with certain characteristics of our universe, namely its entropy. Carroll proposes that universes are created spontaneously by patches of ultra-dense dark energy, which expands rapidly into a vast empty space, before immediately shrinking and "pinching off" to form new, separate "baby universes". Under this idea, the big bang becomes an inadequate explanation for what happened at the beginning of our universe, it is simply another "pinching off" event, and our universe is actually one of these baby universes. 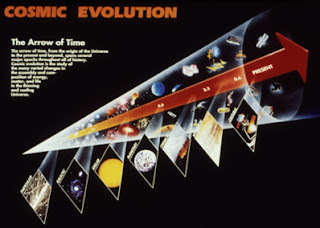 While in our own little baby universe time appears unidirectional, on a multi-universe scale the dark energy from other universes that are expanding, collapsing, and exploding into other baby universes occurs in both directions of time- the past and the future. According to the theory, entropy increases as baby universes continue to be spawned into existence by other universes. 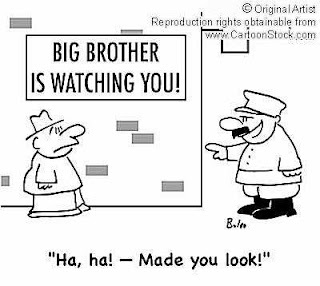 In what I think is a slightly Orwellian experiment, physicists from the Center for Complex Network Research at Northeastern University tracked the locations of 100,000 unknown people outside of the United States for 6 months, in order to determine their movement patterns. They found that about 70 percent of the time, people repetitively visited only 2 locations, which we can assume are work and home. In other words, most people don't get around much. The study was top-secret: performed in a mystery industrialized nation with a mystery wireless provider, and using mystery cell phones that had additional built-in tracking devices. Researchers used information from cell phone transmitter tower logs to analyze people's daily movements. Each tower has a specific zone, and is able to track all motility within that zone (usually about 2 square miles). While the researchers didn't know the exact phone numbers, or precisely where the people were, studies performed without the consent of observed persons are illegal in the U.S. Here's the surprising part: the researchers were not required to check with an ethics panel beforehand because the experiment involved physics, not biology. With apparently little or no ethical restrictions on experiments, it appears that physics is the best subject for completely unfettered intellectual freedom. This may or may not be a good thing. But maybe that's why we will all be drinking space beer soon. To be fair, the researchers who performed the study say more effective monitoring of people's traveling patterns might be useful in figuring how to stop the spread of diseases, or improve future public transportation design. Luckily,instead of spending months getting to know my co-worker Becky, I got to sit down with her and blatantly ask her lots of fun life questions. And she's got a cool tongue piercing. Becky Thompson-Flagg's interest in science, like most things in her life, came about randomly. Sitting on the bus one day in high school, a classmate suggested that Becky would probably like the physics class she was taking, and that Becky should take it too. Not needing any further persuasion, Becky signed up and was hooked. Continuing on to Bryn Mawr College in PA, "I knew that I liked learning, and I knew that I liked science, but I didn't really know what to do about it," she says. Her quest for an intellectual challenge made physics an attractive option. 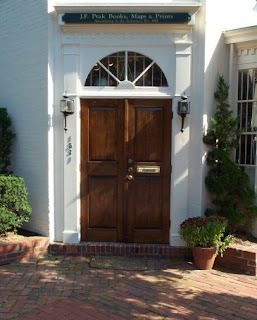 Born in Chicago to a physicist father and high school principal mother, Becky grew up near Annapolis MD. As a child, she was somewhat of a walking disaster, getting into scraps, always covered in bruises. "But remarkably, I've never broken a bone," she laughs. She was also a little nerdy. "The band made fun of me." After completing her BA in physics from Bryn Mawr, Becky headed south to the University of Texas at Austin, where she received her PhD under Michael Marder at the Center for Nonlinear Dynamics. A combination of floral art and physics, her research involved analyzing the elaborate buckling patterns naturally found in daffodils. Crumble of a piece of paper and you get wrinkling, a distinct pattern made up of sharp peaks. "Buckling is kind of like wrinkling, except you get more curved patterns," explains Becky. After computationally creating a triangular net of mass points representing the buckling patterns of the flower, Becky put them into a fourth spatial dimension by adding one variable to all the calculations. "Visualizing it was a bit trickier," she says. She also analyzed nanoflower patterns. 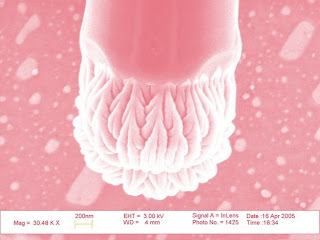 Nanoflowers aren’t real flowers of course, but can be grown in the lab using the same starting materials- a "seed" and "nutrients". In this case, the "seed" is the tip of a silicon nanowire, and the "nutrients" are combinations of different gases. Instead of gardening, Becky's nanoflowers were grown by her colleagues Joonho Bae and Ken Shih, using a specific vapor-liquid-solid method. 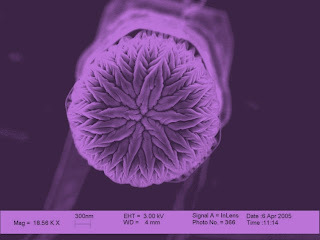 As nanoflowers grow, tiny intricate patterns of silicon oxide form clusters on the wire. None of this can be seen by the naked eye; these beauties are about a thousand times thinner than one strand of human hair. 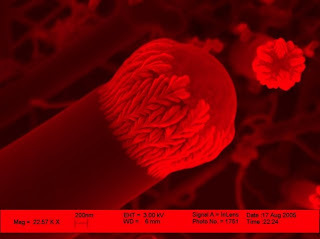 In order for a nanoflower to form, the nanowire itself has to grow, kind of like the growth of a stem before the blossoming of a flower. The more the silicon grows the more complex the flower pattern will be. Becky's research shows that nanowires grow in the presence of gold, which acts as a cataly st to speed up the reaction required for growth. Gold is actually pretty important, you can use the same process to create nanoflowers without gold,but you won't get any cool looking patterns. In her analysis of nanoflower patterns, Becky found that the inner core of the flowers are composed of gold, silicon, and oxygen. This particular composition suggests that oxidation, the exposure of elements to oxygen, is crucial for nanoflower formation. The flowering pattern exhibits a specific type of dense branching often seen in bacteria growth and liquid crystals. This is the first time that dense branching has been found in such a small length scale. When she wasn't researching stunningly complex nano-creations, Becky traveled around Austin to local schools as her alter ego: a one woman physics show. After blowing stuff up, making pickles glow, and smashing glass, she'd leave young minds full of excitement, in awe at the destruction and weirdness science is capable of. Becky knew she didn't want to teach, but loved what she was doing. Solution? Break into the field of physics outreach! After a chance enc ounter and some good luck, she now gets to design fun experiments, play with toys, and get paid for it as a Public Outreach Specialist for APS. 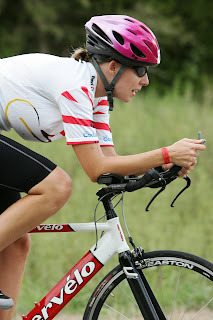 When she's not doing awesome physics outreach work, Becky whizzes by on bicycles, swims, and runs in various triathlons, while somehow finding the energy to train up to 6 days a week. She has two cats and a husband Ned, who is currently back in Austin. "Science Festivals, Science Books and Science Funding"
Scientists have created the first metamaterial made solely of metallic elements, that is able to absorb all the light that hits it with perfection. Metamaterials are artificially constructed materials that have extraordinary properties and are revolutionizing physics, especially in the fields of optics and electromagnetism. While natural materials use light in a limited number of ways, manmade metamaterials gain their unusual properties from their structure (rather than their composition) and can be developed to have properties beyond those of nature, allowing humans to control light in ways that were previously impossible. 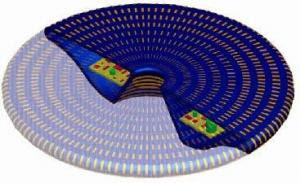 The metamaterial engineered by scientists from Duke University and Boston College has a particular geometric surface, which allows it to completely absorb microwaves. Using computer simulations based on previous data, researchers created the metamaterial by designing resonators capable of individually joining to electric and magnetic components of an electromagnetic wave. Ultimately, structure (how its molecules and atoms are arranged) alone allows the metamaterial to absorb all the light instead of reflecting or transmitting it. The actual material doesn't play a major role in how the metamaterial controls the light that it comes in contact with. 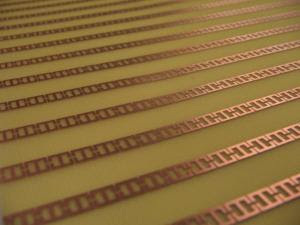 However, because this metamaterial is composed of purely metallic elements, it is flexible enough to be highly favorable in applications related to light detection and collection. An exciting way to start off the week: Astrophysicists at NASA have recently discovered that energetic protons from the plasmasphere control pressure in the earth's magnetosphere. The term magnetosphere (aside from sounding sinister), is used to describe the surrounding region of planets dominated by a magnetic field, like Earth, Jupiter, Saturn, Uranus, and Neptune. The discovery challenges the way most scientists previously thought about the magnetosphere, as being most affected by solar wind. 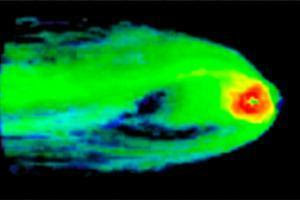 They used a model to stimulate superstorm plasmas (the above picture shows what the Earth's magnetosphere looks like during a superstorm), which are often caused by sporadic ejections of solar material from the sun. These coronal mass ejections send billions of tons of plasma shooting out of the sun and hurling towards the earth at high speeds (millions of miles per hour). 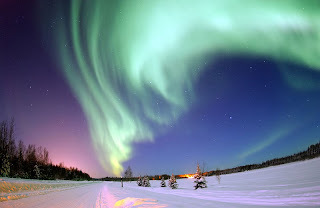 Superstorm plasma isn't without its consequences on Earth, usually in the form of awesome visual displays like the Northern Lights (pictured to the right, as seen from Bear Lake, Alaska). But more damaging effects of plasma include disruption of communications between airplanes and satellites traveling near the North Pole, and suspending global positioning system and power grid functions.